Once again FFM will join another contest of fellow blogger (even-though I still haven't receive the one that I won here of Eji). Well maybe another luck who knows I might also win again this time (crossing fingers). A good reason why I love to blog is to meet more friends online, getting along with other blogger who shares the same passions in writing and of course some freebies like this. Wow!! ganda naman nitong pakulo na to Chris.. open pa ba to? I want to join....wow..one year hosting for free?...a must grabbed opportunity. That's a good one! 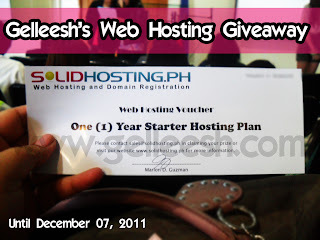 Having your website hosted for free for a year will save you money in getting one. Goodluck! Plus oned your entry too. Hope you win this and good luck. BTW sis, join ka sa New meme ko ha, its about Memory Lane Monday and its up until Thursday. Dami talgang give aways this time of the month.